Two years ago I researched a piece on the new City Heights farmers market for Edible San Diego. Among the people I spoke with was Ellee Igoe, then head of food security and community health at the International Rescue Committee, San Diego, one of the organizations that launched it, and she was talking intensely about starting up a community garden. "We want to help get people to return to farming with 80, 600-square-foot plots as well as three larger spots for people interested in moving into farm incubator projects to produce more for market," she said. "And with a micro-enterprise project, maybe get into leasing land. I’d love to see a partnership between farmers at the market and community members interested in getting into farming but who don’t have land. We have an aging farming population. We need to move people into farming or we won’t have a local food movement. We're in the last phases of permitting with the city. 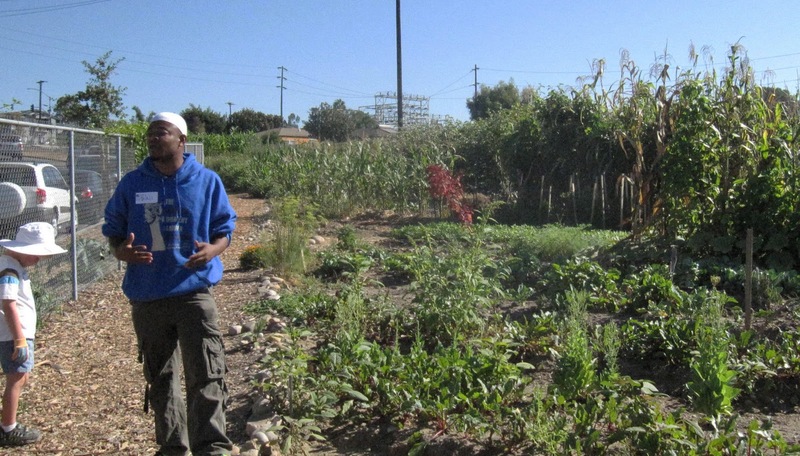 It's taken two years to access the site because there's no policy on neighborhood gardens. We did an open house last April on the site to see if the community was interested. Over 100 people signed up. There's been a waiting list for plots since 2007. Already we've started trainings with different ethnic groups including Cambodian and Somali/Bantu." 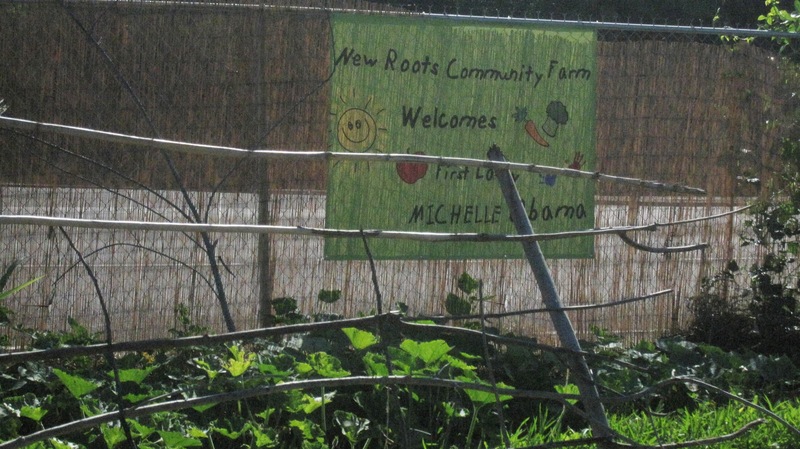 Last year, the New Roots Community Farm--an oddly-shaped two-acre plot just off 54th St. in City Heights--finally opened. And, those 80 plots are being farmed. 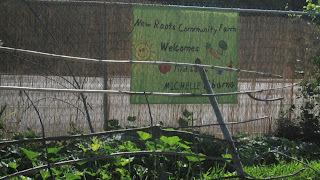 In fact, this farm was one of the stops Michelle Obama made earlier in the year and the welcome signs are still there. I visited today as part of National Volunteer Day. 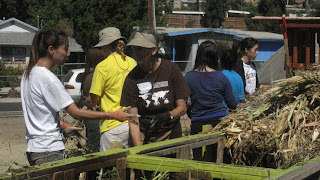 Slow Food Urban San Diego organized a group of volunteers that showed up at 9 a.m. to work until 2 p.m., planting trees and seeds, helping maintain the compost heap, constructing a children's garden, and making planting mix. They would work alongside the neighborhood farmers who were there weeding, planting, and watering their 20-by-30- or 15-by-15-foot plots. 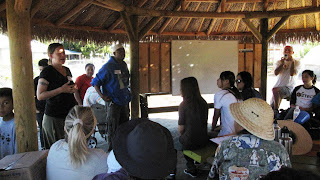 The 30 or so volunteers got a briefing by the organizers before being taken on a tour of the farm by a man named Bilali. A passionate man from Somalia, he talked at length about how important it became for new immigrants who were experiencing a hard time finding work, a hard time learning English, and just a difficult time in a new country to have good, nutritious food that they had grown. 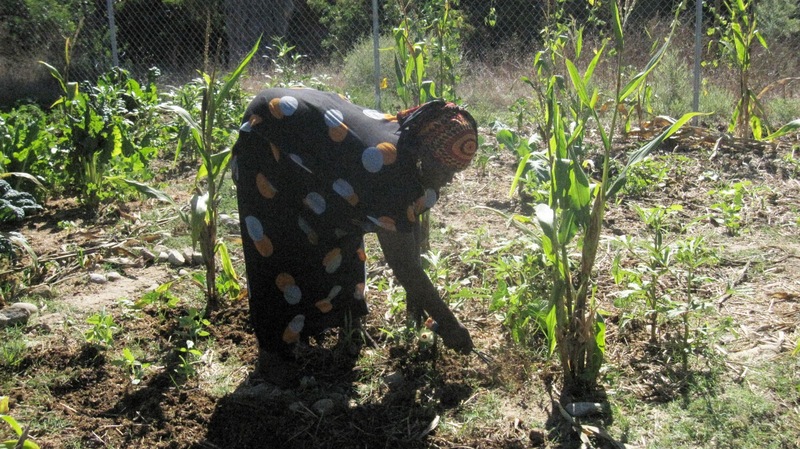 Instead of sitting around an apartment stressed over their circumstances, they could at least be outdoors, growing their own food to stay healthy. 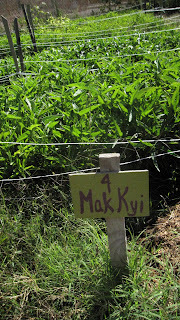 In fact, Bilali explained that this acreage was called a farm, not garden. 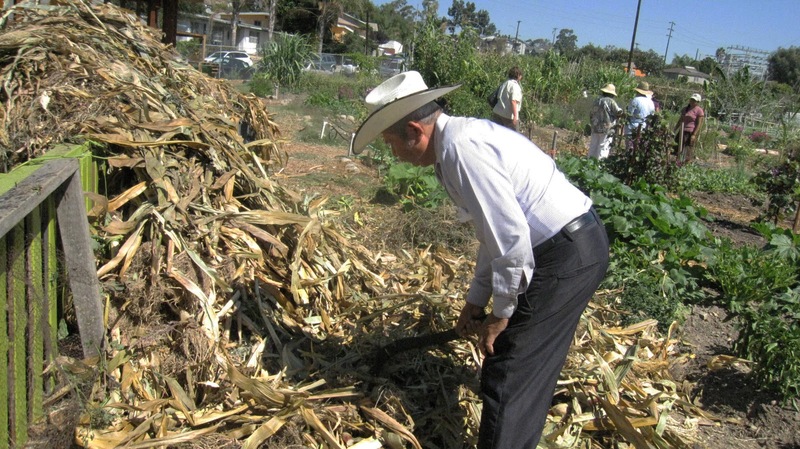 "If you produce food, it's a farm," he said emphatically. All around us were plots growing onions, chard, tomatoes, corn, cacti, okra, squash, and a whole variety of herbs I couldn't identify. 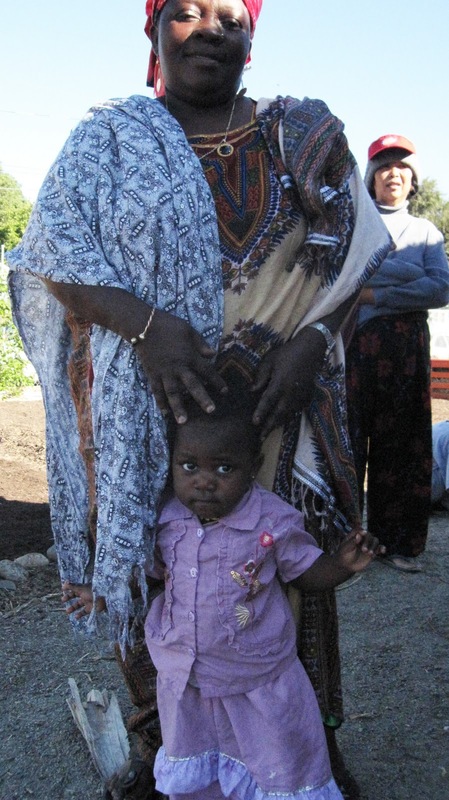 There are plots farmed by Somalis Bantus, by Guatemalans, by Vietnamese. 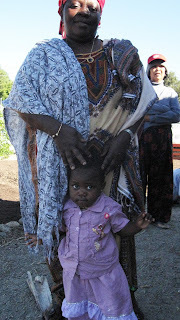 I wandered around the farm and met a woman named Hawa Mjiji from Somalia. 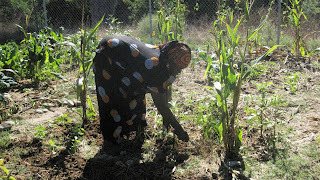 She was busy planting beans and spinach, alongside her okra and corn. Up and down paths I saw little plots, identified only by small, hand-painted signs, usually with a number and a name. While Mjiji was busy with her planting, the volunteers were making inroads in their projects. One was to dig holes and plant two mandarin orange trees and one kumquat. Others were working on the large compost bin, learning about the importance of keeping the piles hot so the contents would decompose but not so hot that they'd, well, catch on fire. Most of the workers were breaking down old corn stalks and were impressed by a local gentleman who was making quick work of them with a machete. 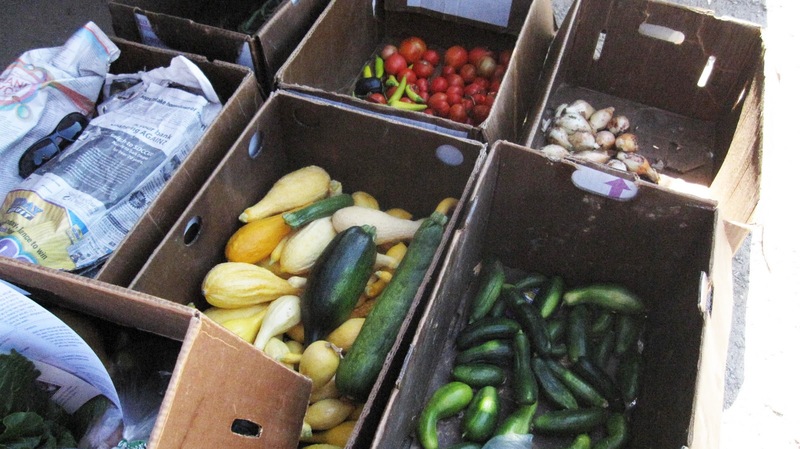 Ultimately, the organizers at IRC are trying to move the concept toward farming as a small business, helping the farmers learn how to do small-scale farm production with sales to restaurants and at farmers markets. They're working with Tierra Miguel in Fallbrook to use three acres there to jumpstart that effort. Already though, Sea Rocket Bistro and The Linkery are buying what produce is available. And, today, the organizers put together CSA bags of produce that they sold to the volunteers for $10 apiece. 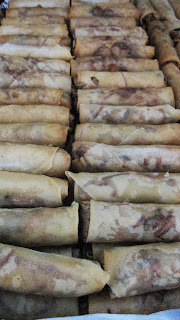 The farmers also put their produce to use with the sale today of homemade sambusas and spring rolls to the volunteers. I loved this woman and her sweet toddler--and it turned out she made the pea-filled sambusas. The spring rolls were filled with noodles and greens. 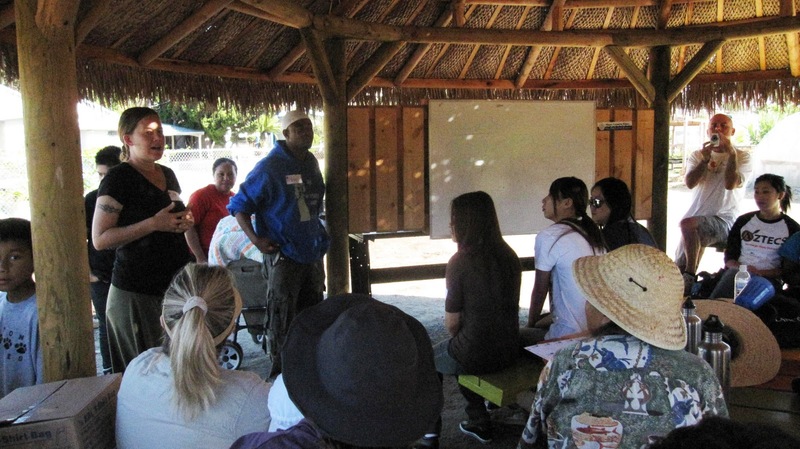 While certainly the main point of the farm is to help members of the City Heights community learn farming skills and provide food for their families, it's had another impact on the community. These groups are all side-by-side on small plots working the land. They don't speak the same language but it turns out that food is bringing them together. 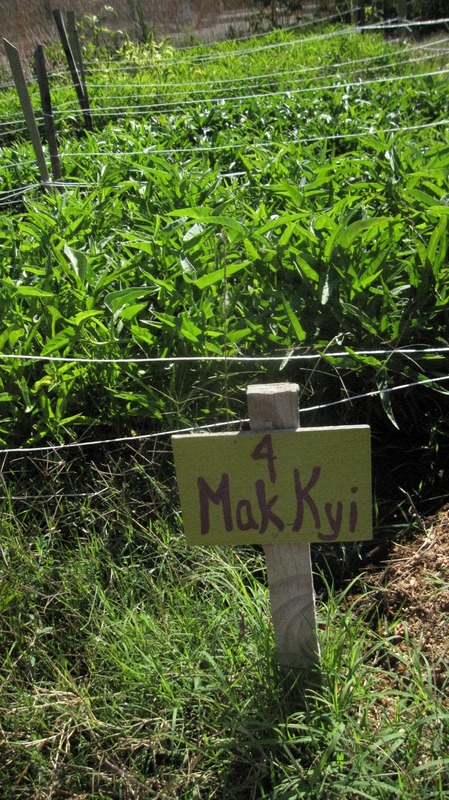 What is traditionally grown and eaten in Central America is also part of the Southeast Asian diet or African dishes. 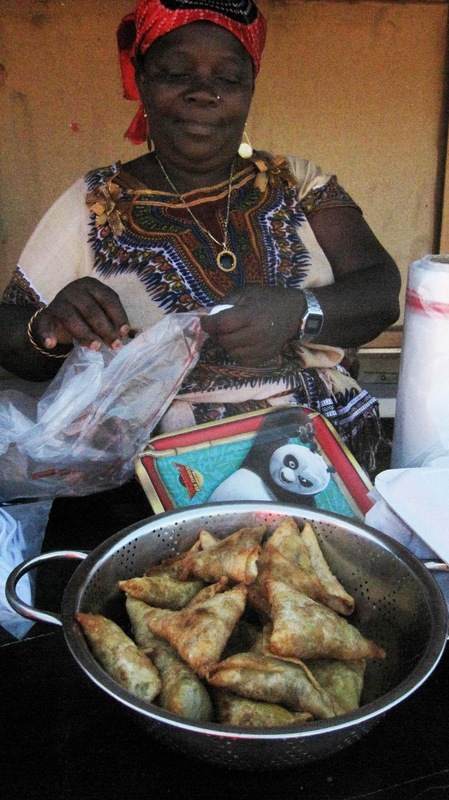 Not unsurprisingly, food has become their connection and has become a starting point for the members of many cultures to learn about one another and improve their community. 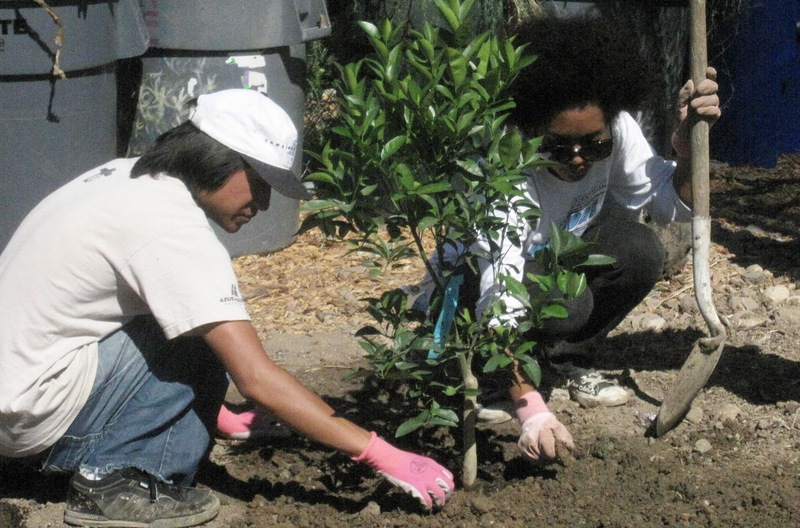 Now, if you'd like to help make these community gardens easier to start, there is an online petition circulating via the Master Gardeners of San Diego, directed to Mayor Sanders and the San Diego City Council. 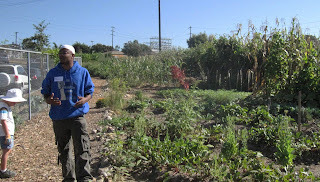 Simply go to the Make San Diego Community Garden Friendly site and add your name, as I did. It really shouldn't be so difficult and expensive to launch a garden and the organizers are advocating that the process be streamlined and made affordable.